Who’s been looking on Pinterest and created a ‘my wedding flowers’ board? Who’s been pinning all the flowery things you like? Now, who’s gone a bit… lets’ say…. Pin crazy? And now when you look at your board you’ve kind of lost sight of what it is you actually really like? It’s a common theme for ALL of us to-be-weds. Now, I would advise that you take some time to study the images and pull out everything (not literally of course) you like within the picture. Is it the colour of the flowers? The style of the floral elements? Or is it the flowers themselves? Maybe you have pinned any image that has a candelabra flower display within it and you’ve not actually realised it? Trust me, take the time to do this and you will start to see a theme emerging. This can really help you with your decision making. One of your emergent themes will be colour - there is no doubt about it! But… what if you don’t think the colours work well? Or maybe your stuck for colour choice? Don’t worry! I’m going to discuss the complexity that is colour and help you with your wedding plans. There are five common types of colour harmonies and each one is distinctly different. The first one I want to talk about is Complimentary. Complimentary colours provide the most contrast and are directly opposite each other on the colour wheel. Pairing opposite colours draw the most attention to and makes them stand out. As such, red looks most red when opposite green, and green, looks most green, when opposite red. Choose colours (hues) that complement each other if you are wanting colour popping, show stopping floral elements. 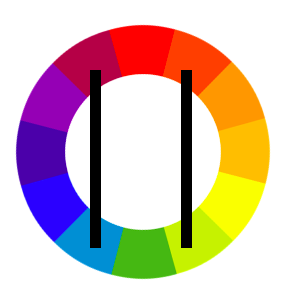 The second colour harmony is Triadic. A Triadic colour palette is created using the three points of a triangle that are of equal distance on the colour wheel. The original triad of colours you will know of are the three primary colours; red, blue and yellow. If you want a slightly less common colour palette for your wedding flowers and want something unique and interesting, choose this colour harmony. The third colour harmony is Analogous. The Analogous colour palette is a subtle combination of three or more colours in direct succession on the colour wheel. The hues blend together naturally with no harsh presence. Choose this colour harmony if you want your wedding flowers to be whimsical looking, low key and pleasant. The fourth colour harmony is Monochromatic. A Monochromatic colour palette is created from one single hue on the colour wheel. The single hue is used with variations of that hue in either a tint, tone or shade. If you want to use just ONE colour for your floral elements, opt for a monochromatic colour pallet so you can see a variation of that hue and create an Ombre’ type feel. The fifth colour harmony is Tetradic. A Tetradic colour palette is a pair of complimentary colours running parallel to one another on the colour wheel. Pairing two complimentary colours is the ultimate contrast. If you want something vibrant, something big and bold this is the colour harmony for you. Learning about the different colour harmonies will allow you to: expand your reach when it comes to colour, know which colours will work well together, make a conscious decision and will help you achieve and execute the vision you have for your wedding day. Now’s the time to go back to your Pinterest boards and pick out the colours you are attracted to. What colour harmony will you choose?